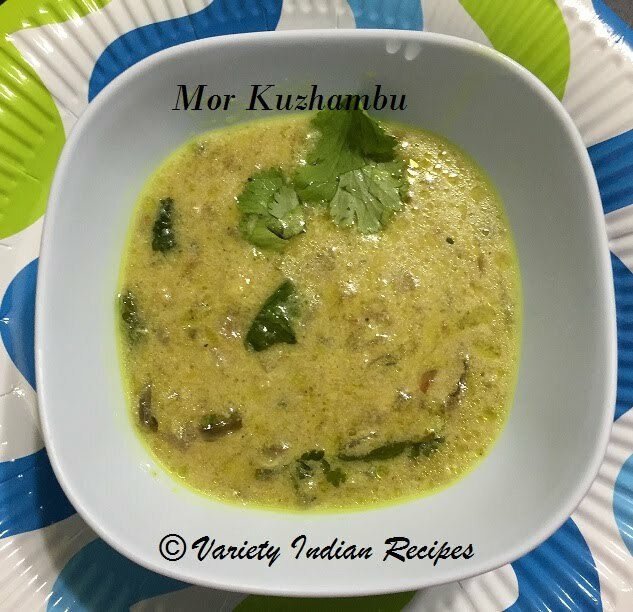 Mor Kuzhambu is a simple dish made out of buttermilk. With mild flavours it tastes awesome when served hot with rice. For this recipe I have used Vellai poosanikai(also known as white pumpkin / winter melon). You can use Ladies finger(Vendakkai \Okra) instead of white pumpkin. Soak toor dhal and rice in water for half and hour. Grind the soaked dhal and rice with grated coconut, cumin seeds, curry leaves and green chillies. Add turmeric powder and saute. Add the grounded paste and saute well for about 5 minutes. Now add Vellai poosanikai and saute, add 1/4 cup of water and salt and allow it to cook until it becomes tender. Now add buttermilk and adjust salt accordingly. Once the buttermilk begins to boil turn off the flame.